DENVER, Pa. – On Oct. 27 – a mere four years after opening its doors – Morphy Auctions rewrote the history books with its $7.7 million sale of the celebrated Stephen and Marilyn Steckbeck mechanical bank collection. Now widely acknowledged as the highest-grossing toy auction of all time, the 492-lot sale surpassed the previously held record by a margin of more than $2.5 million. The result has been reported to the Guinness Book of World Records. The gallery buzzed with energy as notables of the bank-collecting world gathered under one roof to avail themselves of a once in a lifetime buying opportunity. Many hobbyists concurred that the Steckbeck collection, with its many rarities and consistently superior condition, was the finest grouping of its type. As Stephen Steckbeck himself had noted in the run-up to the sale, the collection held many “onesies and twosies,” a reference to banks that were either the only known example or one of only two known examples. The media had responded with a level of enthusiasm rarely encountered at a toy auction. A CBS Television crew spent the better part of three days at Morphy’s, taping both the preview and actual auction, and interviewing key individuals. The result of their efforts will be seen in a future edition of CBS’s prestigious Sunday Morning show. NBC Television also arrived at the gallery with cameras in tow. A team from the network’s regional affiliate in southeastern Pennsylvania, WGAL-TV, produced a segment about the auction that ran as the lead news story on the evening before the auction and again on auction day. It was, of course, the banks that were the stars of the show. The first money box to more than double its high estimate was a circa-1883 J. & E. Stevens Bismark [sic.] Pig, which unflatteringly depicts Otto von Bismarck riding inside a large porker. With many absentee bids in place, it opened at $45,000 and quickly sold for a left bid of $57,500. Several rare banks with an African-American theme challenged their estimates to land in six-figure territory. A circa-1888 Stevens “Darky and Watermelon” bank, whose action involves a topped-hatted black gentleman kicking a football over a watermelon, went to an absentee bidder for $195,500. Hands waved all over the room when an 1880s Charles A. Bailey painted-lead bank known as “Darky Fisherman” took the block. When the lever on this particular bank is depressed, the fisherman’s arm raises the pole to reveal a caught fish at the end of the hook. As the fish surfaces, the fisherman’s cap simultaneously flips up to indicate the sportsman’s surprise. Opening at $50,000, the bank reeled in an astonishing $287,500. Another big-money lot was the Steckbecks’ near-mint-plus example of a circa-1886 Kyser & Rex Mikado bank. Aided by a complex interior mechanism, the bank’s central figure – a brightly robed and hatted illusionist who stands at an elaborately decorated Chinese table – performs a sleight-of-hand maneuver similar to a “shell game.” Estimated at $120,000-$150,000, the Mikado opened absentee at $230,000 and soon sold to a bidder in the room for $250,000. Kyser & Rex productions were strong across the board. An example of the Philadelphia company’s 1880s Roller Skating Bank, which depicts skaters gliding around a rink, smoothly exceeded its presale estimate to finish at $195,500; while a Kyser & Rex Merry-Go-Round from the same timeframe, in near-mint condition, caught the brass ring at $172,500 against an estimate of $70,000-$100,000. A circa-1910 North Pole bank – possibly the best example known – and a Germania Exchange bank, which pictures a goat standing atop a beer barrel with a mug in his hands, each achieved $149,500. Both banks were made by J. & E. Stevens Co., a prolific 19th-century cast-iron bank manufacturer that was based in Cromwell, Conn. The top lot of the sale was a Stevens production of the late 1880s known as Jonah and the Whale – Jonah Emerges. In near-mint-plus condition, the cast-iron bank whose action illustrates the Old Testament story of Jonah, who spent three days in the belly of a whale before being expelled, opened at an impressive $100,000. With numerous collectors chasing the rare and beautiful example, it garnered applause as it landed at a breathtaking $414,000 – a world auction record for this particular form. 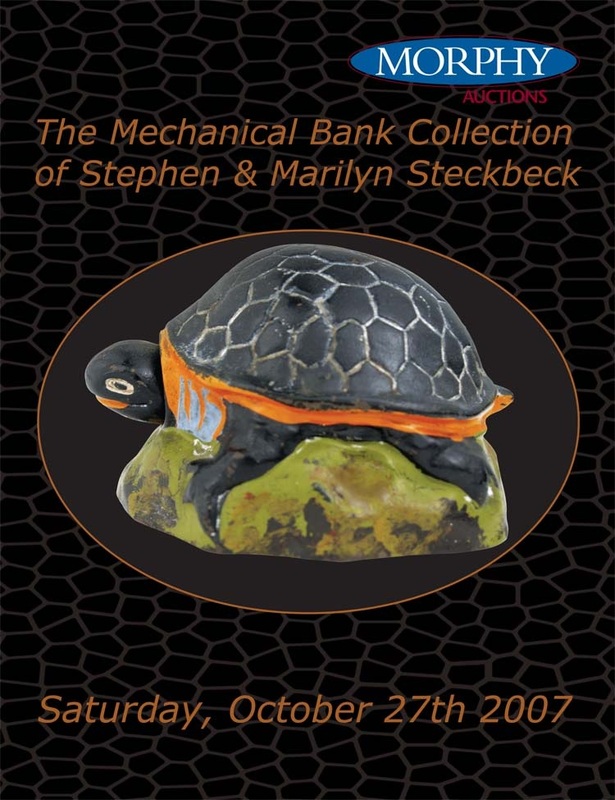 View top lots and full prices realized from the Steckbeck bank auction online at www.morphyauctions.com. Morphy’s will hold its Winter 2007 sale Dec. 6-8 at the Adamstown Antique Gallery, 2000 N. Reading Rd., Denver, PA 17517 (on the Adamstown antique strip). For additional information, call 717-335-3435 or email morphy@morphyauctions.com.